BTS (Hangul: 방탄소년단; RR: Bangtan Sonyeondan), also known as the Bangtan Boys, is a seven-member South Korean boy band formed by Big Hit Entertainment. They debuted on June 12, 2013 with the song "No More Dream" from their first album 2 Cool 4 Skool. They won several New Artist of the Year awards for the track, including at the 2013 Melon Music Awards and Golden Disc Awards and the 2014 Seoul Music Awards. The band continued to rise to widespread prominence with their subsequent albums Dark & Wild (2014), The Most Beautiful Moment in Life, Part 2 (2015) and The Most Beautiful Moment in Life: Young Forever (2016), with the latter two entering the U.S. Billboard 200. The Most Beautiful Moment in Life: Young Forever went on to win the Album of the Year award at the 2016 Melon Music Awards. Their second full album, Wings (2016), peaked at number 26 on the Billboard 200, which marked the highest chart ranking for a K-pop album ever. In their native South Korea, Wings became the best selling album in the Gaon Album Chart history at the time. 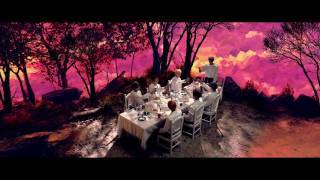 The album went on to sell more than 1.5 million copies, making it BTS' first "million seller", and the group was subsequently awarded Artist of the Year at the 2016 Mnet Asian Music Awards. The group's next release, Love Yourself: Her (2017), debuted at number seven on the Billboard 200, marking the highest rank for an Asian artist in history. The group also managed to debut on the Billboard Hot 100 for the first time with the album's title track, "DNA", which entered at number 85 and peaked at number 67. Another track from the album, "Mic Drop", was remixed by Steve Aoki with a feature by Desiigner and peaked at number 28 on the Billboard Hot 100. Both tracks went on to be certified Gold by the Recording Industry Association of America, a first for any Korean act ever. The album sold over 1.2 million copies on South Korea's Gaon Album Chart in its first month, reclaiming its title as the best selling album in the chart's history and becoming the biggest selling Korean album by month in 16 years, coming second to G.o.d's album in 2001. BTS was awarded the Mnet Asian Music Award for Artist of the Year for the second year in a row in 2017. Their third full album Love Yourself: Tear (2018), debuted at number one on the Billboard 200, making them the only K-Pop act to achieve this feat so far. Since their debut, they have sold an estimated 7 million albums worldwide. Known for their large social media presence, BTS were listed by Forbes as the most retweeted artist on Twitter in March 2016. Following that, Twitter launched its first ever K-pop Twitter emoji featuring BTS in May. In October 2016, Billboard placed BTS as number one on their Social 50 chart, making them the first Korean group to top the chart.To date, they have spent 83 weeks as number one on the Social 50 chart. That same year, they also charted on YouTube's Music Global Top 100: 17th on the video chart, 6th on the artist chart and 14th on the tracks chart. In May 2017, they won the Top Social Artist Award at the Billboard Music Awards, becoming the first Korean group to win a BBMA. In June 2017, Time magazine named the band one of the 25 most influential people on the internet. On November 20, 2017 Guinness World Records revealed that BTS had earned a spot in their 2018 edition for "having the world's most Twitter engagements for a music group". That December, they were revealed to be the most tweeted about celebrity in 2017, being "liked or retweeted over half a billion times (502 million)" worldwide, more than U.S. President Donald Trump and Justin Bieber combined. BTS' achievements led the group to be ranked number one on Forbes Korea Power Celebrity list for 2018, a list ranking South Korea's most powerful and influential celebrities.